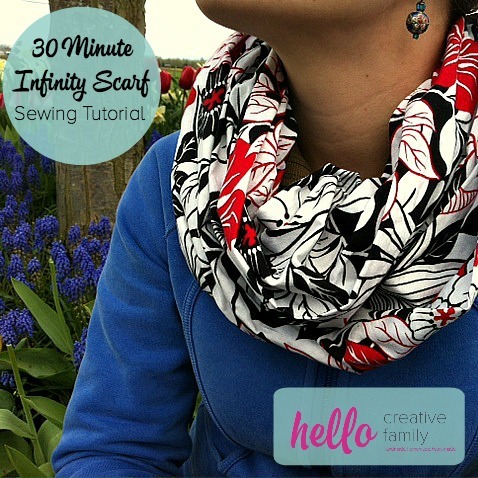 Today on Hello Creative Family I am going to share a tutorial with you on How To Sew An Infinity Scarf . 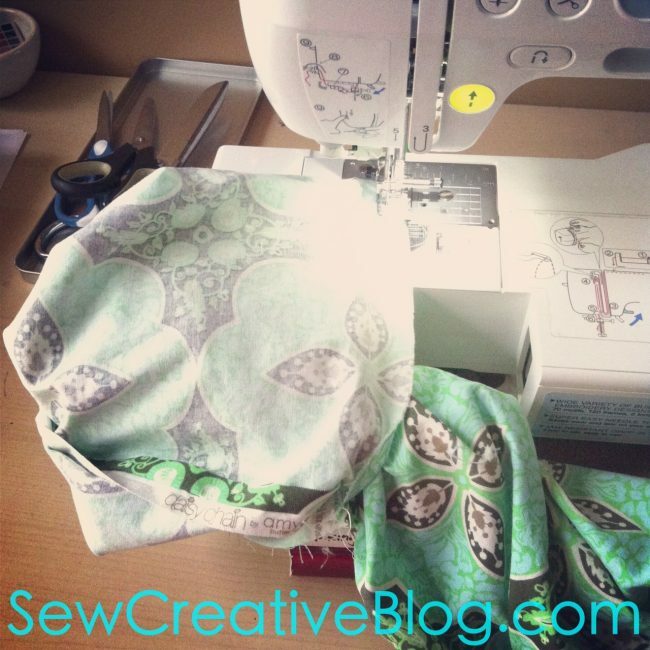 If you know how to use a sewing machine you can make this scarf. It’s a great beginner project and only takes 30 minutes to make (aka it’s a great naptime project). I made a bunch of these for Christmas gifts this year and they were a big hit. I plan on making a few more for myself when I go back to work because they dress up any outfit. They are the perfect accessory that goes from winter to summer. 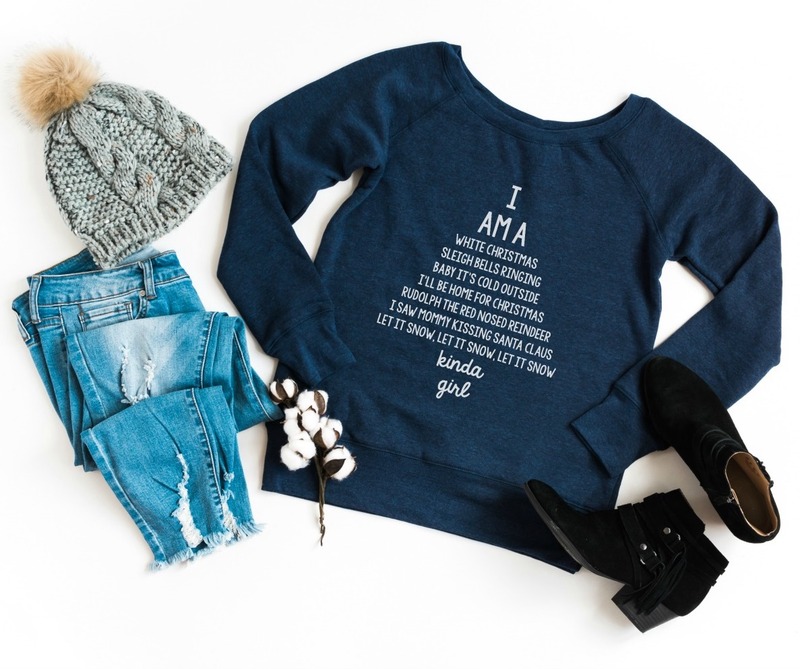 It looks just as good paired with a sweater or winter jacket as it does paired with a tank top, t-shirt or hoodie. 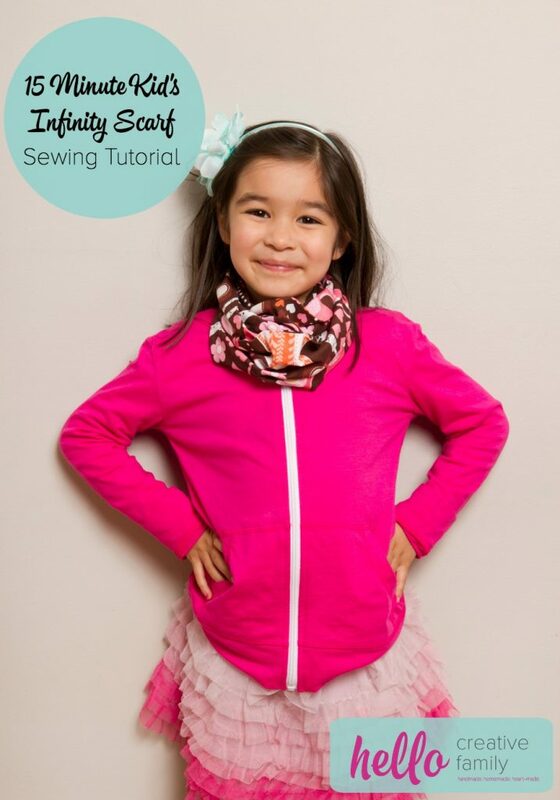 UPDATE: Check out our 15 Minute Kid’s Infinity Scarf Sewing Tutorial too and make a “mini me” version of the scarf featured in this tutorial. There are a lot of infinity scarf tutorials out there, but looking at them I would always get confused about how you sew the two ends together once you have a long tube. I hope that all of the photos in my tutorial make the process a bit easier for your first time than it was for mine. So without further ado, let’s sew an infinity scarf. Step 1: Select your fabric. You will need 2 yards. 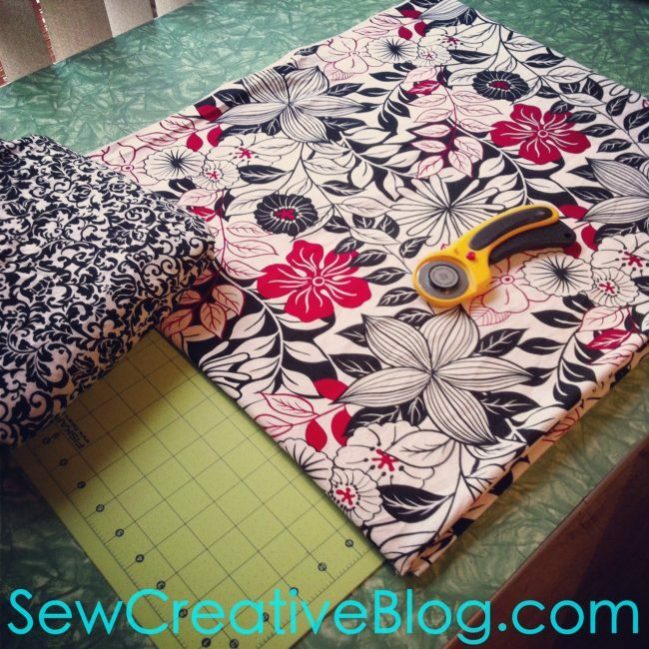 Cut your fabric in half lengthwise so that it measures approximately 22 inches in width by 2 yards in length. I leave the selvage on the fabric as this will be hidden on the inside of the scarf. 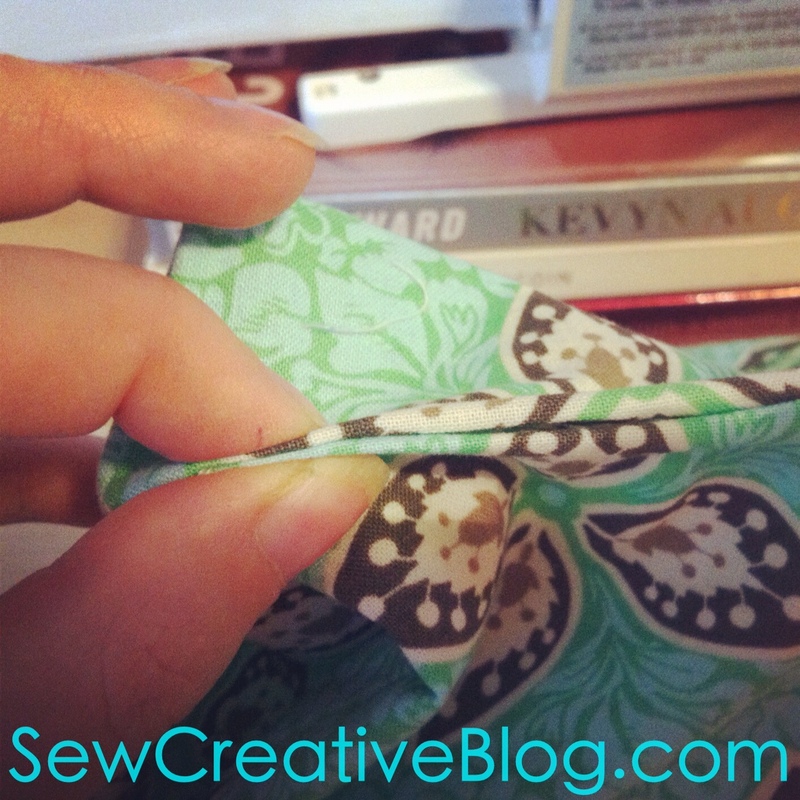 Step 2: Fold your fabric in half lengthwise and pin right sides together (so that the pattern is on the inside). You will have a long rectangle of fabric that is approximately 11″ in width and 2 yards in length. Step 3: If the ends of your fabric are uneven this is the point where you will want to square them up. You will want nice straight end pieces for when you sew the two ends together later in your project. Step 4: Sew along the length of your infinity scarf where you just pinned. I use a half inch seam allowance to make sure the selvage edge is hidden within my infinity scarf. When you get to the end back stitch. (Make sure you just sew along the length of the fabric, don’t do anything with the ends yet.) When you are done you will have a very long tube. Step 5: Lay your scarf on your ironing board with the seam in the middle of the scarf. Using the tip of your iron press open the seam. Step 6: Flip your scarf so that it is right side out. I just stick my arm through the hole in the middle, bunch it up until I could reach the other end and pull it through. Step 7: Fold you infinity scarf in half so that the two open ends are laying on top of each other. It will now measure approximately 10″ by 1 yard. With the two ends of your scarf in your hands find the seam that you just pressed open. Pinch together so that the seams are lined up and the right side of the fabric is facing each other. Pin. Start working your way about a quarter of the way around the circle adding pins as you go. Bring to your sewing machine. Step 8: You are now going to be sewing the two ends of your scarf together. 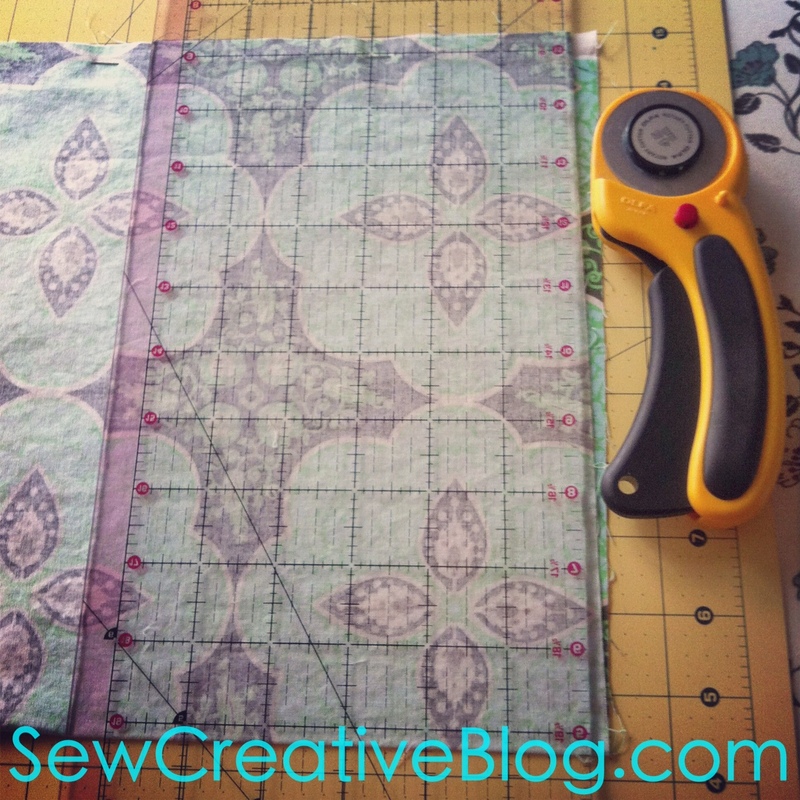 You will be sewing through two layers of fabric. 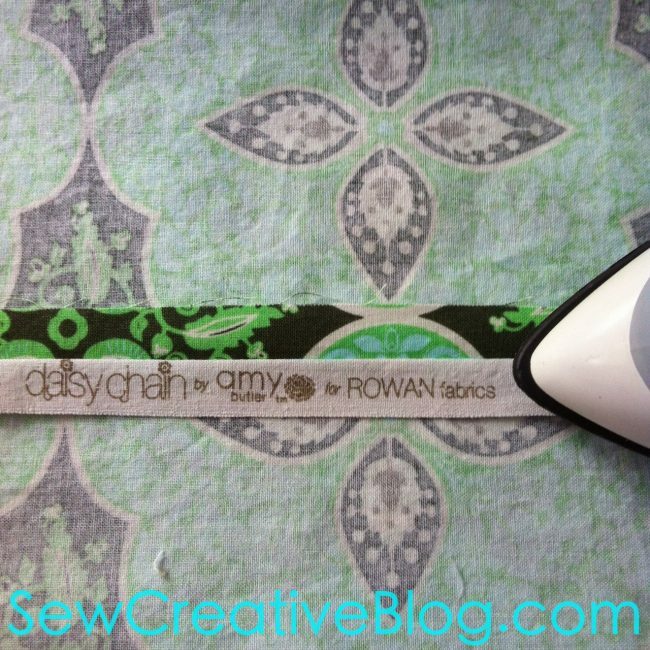 I loop the bottom circle of the scarf around the bottom of my sewing machine and leave the top circle free. Start stitching around the circle leaving a half inch seam allowance. Step 9: Keep sewing around the circle slowly, making sure your edges are matched up. 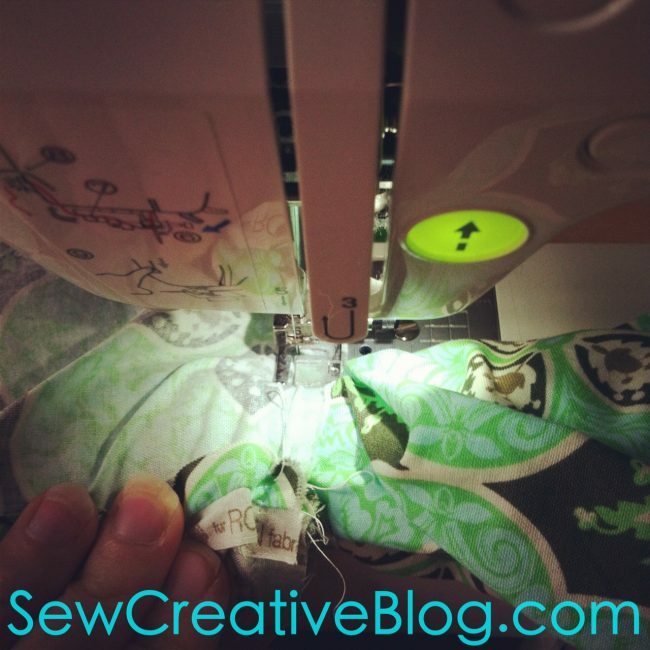 Once you get a little bit past half way around the circle the loop around the bottom part of your sewing machine will get too tight to continue sewing. 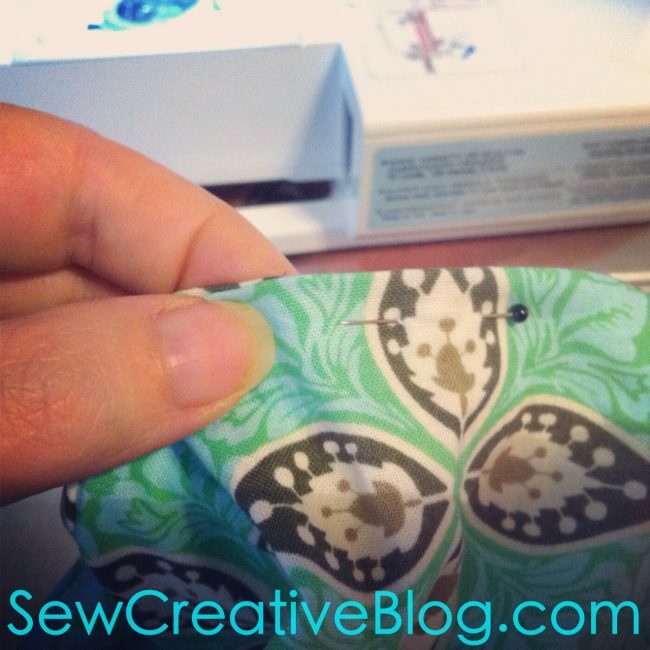 Slip it off of the bottom of your sewing machine. Take your top section of fabric. Flip it inside out so it makes a little pocket and put the top section of scarf inside it. Bunch that part of the scarf down (where the bottom of my picture is) so it takes up as little room as possible. Keep sewing your seams together until you are about to hit the part of the scarf you have in the pocket. (This should leave you a couple of inches to flip the scarf back right side out and hand stitch the remainder.) Backstitch, remove from sewing machine and pull scarf out of pocket. When you take it off of your machine it will look something like this. Yay! The sewing machine part of this project is over. Step 10: Tuck the raw edges inside the hole and pinch together. Step 12: Hand sew the hole closed using a hidden stitch. Wearing your infinity scarf: When I first tried on my infinity scarf I had the scarf laying flat. I thought to myself “This looks awful! I must have done something wrong!” I messaged my friend Eleanor from Moo and Bear who was also on an infinity scarf kick and the two of us tried to figure out why it didn’t look right. Here is what we figured out… Make sure that your scarf doesn’t lay flat. Pull the two sides of the tube away from each other and fluff it up so it gives a fuller appearance. Loop it around your neck twice and puff up if necessary. I hope that you have loved this Sew Creative Infinity Scarf Tutorial! Please let me know if you have any questions and I will do my best to help. Make sure to check out our other Tutorials. Love this scarf! 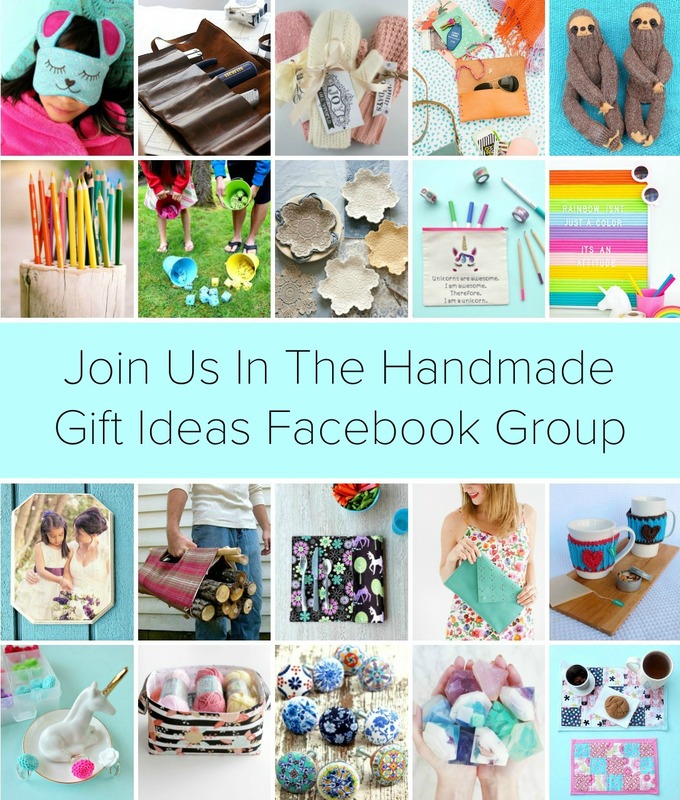 Such a perfect idea for gifts, can’t wait to make some! Thank you Christina! You’ll have to send me a pic when you make one. :) They do make fabulous gifts. Child sized ones would be adorable too! I absolutely love this tutorial and thank you so much for showing how to make these beautiful scarves. I only have a few questions though. What is the best type of fabric to use? Polyester faux satin or silk maybe? Or would 100% cotton work well? Thanks hon. I can’t wait to make a bunch of these. Really you could use any kind of fabric. The one in the photo is a 100% cotton fabric. One person commented saying that she made it with cotton and found it too stiff for her liking. I think the best suggestion would be to play with the fabrics at the fabric store and see what you like the drape of best. Happy scarf making and thanks so much for visiting! Crystal have you tried using ball point needles with jersey? I really had no idea how much nicer it was to sew with the proper needle! I thought you just left the same needle in for everything! Newbie here huh? I am so looking forward to sewing one of these scarves! I absolutely love these scarfs. .can’t wait to make some for my twin daughters and me. . This looks great! Thanks for sharing, I’m going to pin it! I just inherited a really nice sewing machine and after I learn a few basics this is the first that I’m going to try! Thanks for visiting and for the pin! This is such a great beginner sewing project. 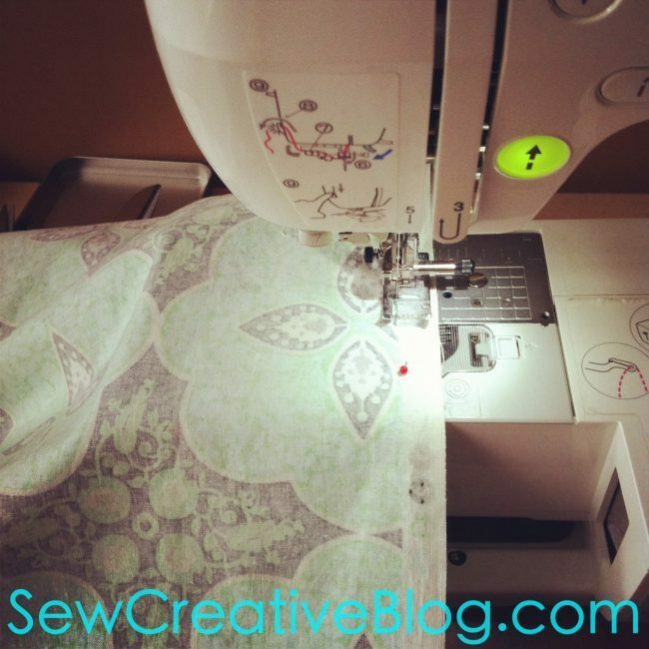 As long as you can sew a straight line you have it! Please let me know if you get stuck anywhere along the way. :) I’d love to see a picture when your done. This is the kind of project I can get behind! I somehow always trap myself into projects that last a couple days. Haha!! I have a ton of fabric stashed with no purpose, so I may have to try this soon. I really like your cute elephant and this scarf is gorgeous. I would like to thank you for joining the fun at Linkin’ with my Ladies Blog Hop. I followed you via Twitter, liked your FB and Pinterest. Thanks so much for hosting and for stopping by Judy. Isn’t the elephant fabulous? I found him at a garage sale. He was bought in Thailand and is supposed to be a children’s toy. I had been looking for a new, fun pin cushion and the moment I saw him I knew I had to have him. I’m glad I found your blog through Friday Fun Blog Hop (Created by Laurie). I love your creations. This tutorial is perfect!!! I leave the link to my blog, I hope you’ll visit me and if you like I invite you to follow me. 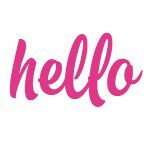 New follower here with bloglovin and pinterest! Thank you so much for stopping by Marisa! I’m going to go take a look at your blog. :) I really appreciate the follows. I think you nailed the tutorial! Well done. It looks great. Thanks for sharing. I think this is something my daughter would love to try. Thank you so much Robin. This is my first sewing tutorial so I hope it’s easy enough to follow along with. If you daughter tries it I’d love to hear about how it turned out and see pictures of her project! Thank you so much for stopping by and commenting Kate. :) The thing I love about using fabric for a scarf is that is that it can go from season to season so easily. I always get funny looks when I wear my knit scarves in the heat of summer. ;) The infinity scarf is becoming an accessory staple in my wardrobe. really nice infinity scarf, thank you for the tutorial! I love the fabric you chose for this infinity scarf. Thank you for the simple tutorial. I’m loving all the pictures! Last night was my first night hosting a linky party at redflycreations(dot)com! I would love to have you link up this tutorial. Thank you so much for sharing all your wonderful creative ideas! Done and done. :) Thanks for the invite Melissa. How fun that we have the same machine! Off to check out your blog. :) Thank you for stopping by. Such a fabulous post! I’ll have to try this :) Stopping by from the SITS Sharefest. Have a great weekend! So lovely!!! Love the idea and the fabric! Thanks so much for sharing the great tutorial! Would love to have you visit me sometime. Off to visit your blog. Thank you so much for stopping by and for your lovely compliments. 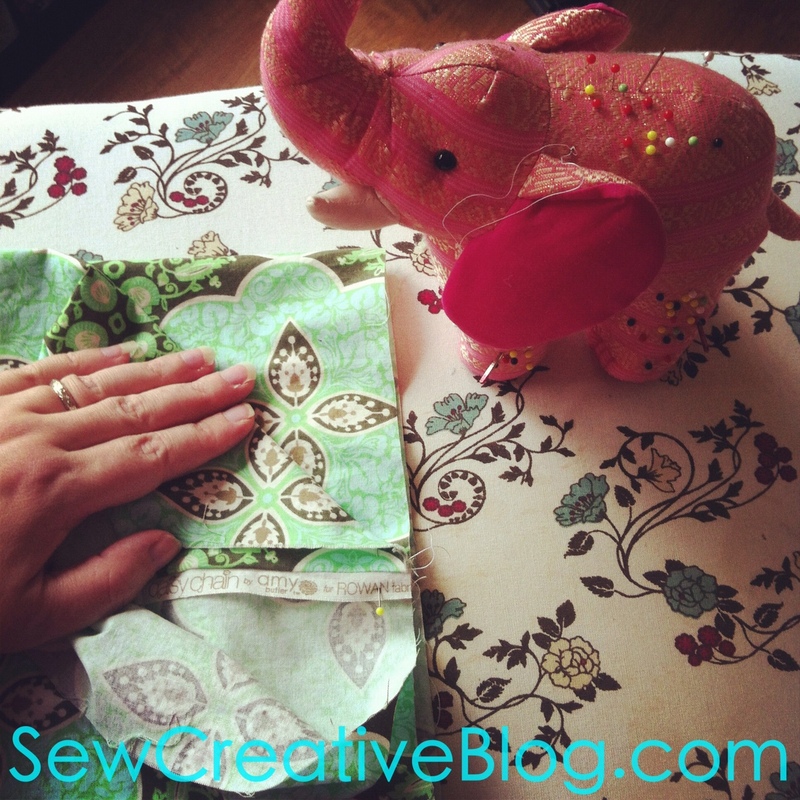 I am hoping to get more sewing time this summer. I’ll have to come back to this one. Happy Sharefest! I love the black, white, and red fabric! Gorgeous scarf! And that elephant pin cushion is awesome! I love elephants! Thank you so much T’onna! I picked up that elephant at a kids swap meet. They were selling him as a kids toy. The moment I saw him I knew he had to be my pin cushion. They brought him back as a souvenir from Thailand! Thanks so much for posting this tutorial. I’m a beginner at sewing, so instead of taking me 30 minutes, it took about 2 1/2 hours. hahah I added a zipper, which added extra time. I also was confused on the “end” part. I figured it out, and I am happy with the result. I think I might make another one, without the zipper. I would hope that it might take me closer to 45 minutes! Here’s hoping! Thanks again! Visiting from SITS…what a great project for my teens to do this summer–they love these scarfs! 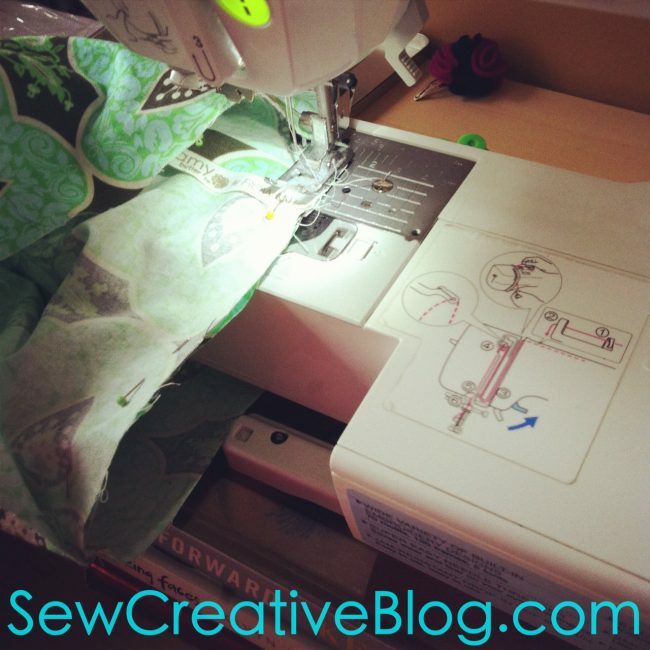 Great tutorial, great photos–you’ve inspired me to get my sewing machine out! Visiting from SITS. This looks like so much fun! It’s too bad that I can’t sew very well or I’d have a field day!!! What a great idea for presents. 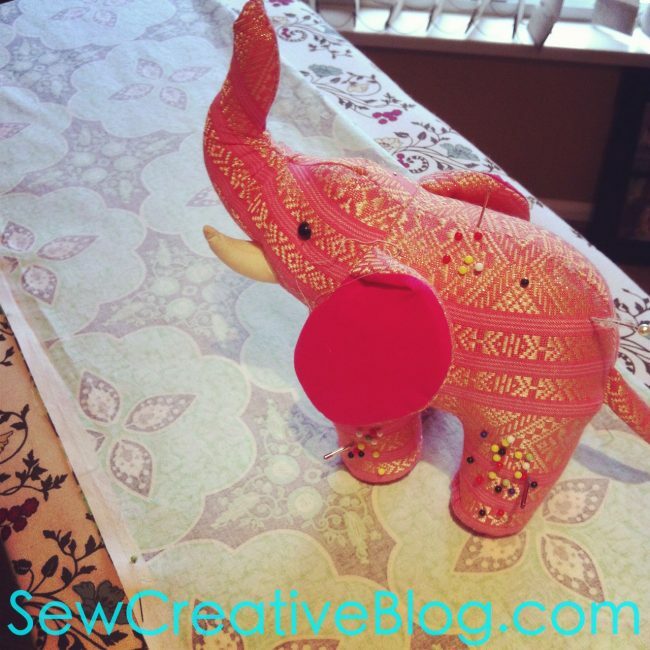 Love the elephant pin cushion and how you used him in the photos. Happy SITS Day! I remember this blog from a Saturday Sharefest. Back again. Enjoy your SITS Day. This tutorial is great! Thanks! And happy SITS day! I can’t wait to try this! Your photography is really good. Maybe sometime you can post tips on taking good photos of craft tutorials. I love infiniti scarves. I wish I knew how to sew so I could make my own. They look so easy! what a great tutorial! 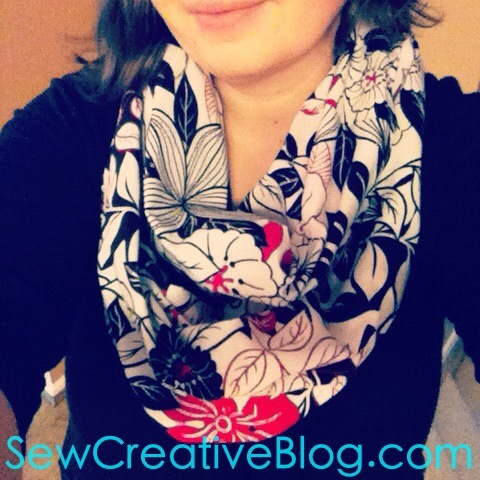 I would love to make an infinity scarf…now I just need to learn how to sew! :) Happy SITS Day! So cute! I also love how easy the instructions are! Have it pinned to my pinterest and will definitely be making some of these! Thanks so much for sharing. Visiting from SITS! My daughter loves infinity scarves!!! I will have her make me one, or have her teach me how to sew :) Happy SITS Day!!! LOVE this! I love scarves and think this would be a great gift especially since they are so IN right now :) Thanks for this great tutorial and happy SITS day!! Hopping over from SITS. I love this sewing project! I have some fabric from when I thought I could sew my own maternity clothes. .. a little ambitious. I’ve been wanting to buy a new sewing machine with embroidery option. Is it better to buy a used one or new? Which stores have the best pricing? Fantastic question Elle. I would say that buying used or new depends on what level of sewing machine you want to get. 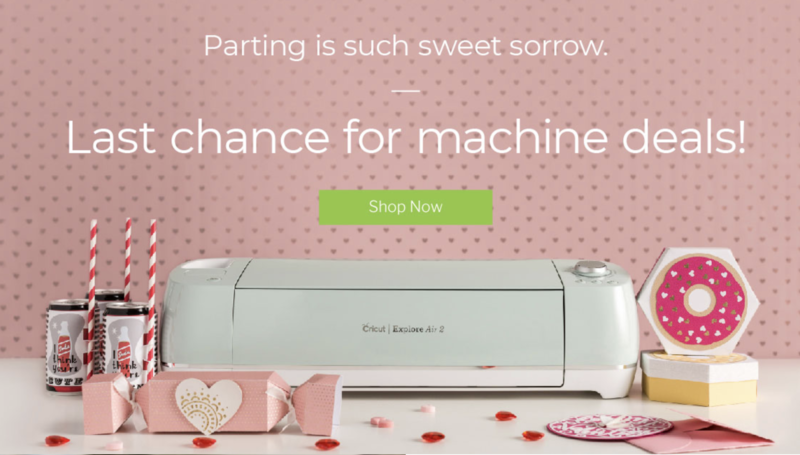 One thing that you want to take into account when buying an used sewing machine is that you would most likely have to get the used machine serviced before using it. Servicing a sewing machine costs $100+. I bought my Brother SE-350 on Amazon as a Gold Box Deal. I’m trying to remember back, I think that it was $300 or less. If you are buying a machine in that price range I would suggest buying new. However if you are wanting to buy an expensive, industrial machine, that sell brand new for thousands of dollars, you may want to consider buying one second hand. With a more expensive machine the discount you would get on it by buying second hand would offset the price of having it serviced where that wouldn’t be the case with a less expensive machine. Wonderful idea. 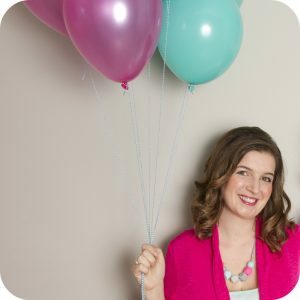 I also write for amazinggoodwill.com offering ideas and tips on repurposing or upcycling items I find at the stores. This would be a great project using an old skirt or blouse! I have gotten to the part where I have flipped it right side out after ironing, and my two ends are now together after folding it in half. I am very confused as to what the next step means (before sewing the ends together) Help! Joining your two ends is the hardest part. Once you figure it out once you will never forget it. Then just sew around the circle leaving a gap at the end. Check the tutorial for my kids scarf and see if it makes any more sense to you. It’s one of those things where you say “hunh?” when you’re reading it, but once you actually put it on your machine and start it starts to make sense. Let me know if it doesn’t make sense and I’ll try to figure out another way to explain it. What material do you use? Cotton? Let me know if you have any other questions. Thank you so much for stopping by. I haven’t ever sewn anything before (using a sewing machine, that is) and I want to make sure I understand how to do it before I start sewing. I have bought my fabric already; it’s about 3/4 yard by 60 inches, as that’s what other sites have said will make a short scarf. I understand how to make it a tube, but I don’t get why you flip it right side out before sewing the ends if you don’t want the seam to show…shouldn’t you keep it right side in the tub and then sew the ends except for a bit that allows you to pull it out again to finish? I don’t really get how you put the ends together. Please help! Thanks in advance. BTW I got my fabric at Jo-Ann Fabrics on sale, 70% off! I bought fabric for six scarves using five different patterns. It was all less than $13 which I used a gift card for! I thought it was a score. :) I’ll be selling these scarves (although I might keep one, hehe) and giving all the profits to charity. Just thought I’d share that as it’s a fun thing to do and helps out other people! I did a second tutorial on how to make a kid’s infinity scarf so maybe look at the pictures for sewing that one closed too and see if it becomes any clearer? I’m so jealous that you have a Jo-Ann Fabrics near you. I have to cross the border to get to a Jo-Anns store. I can make scarves for half the price or even a quarter of the price buying my fabric at Jo-Anns then by buying it at a Canadian fabric store. I try to plan in a visit to Jo-Ann’s whenever I cross the border. Yes, I live in Minnesota, USA so there is one about 10 minutes (at most) away. Okay, my aunt taught me how to sew and I’ve done three scarves in 24 hours! :) I have three more to go. So far, so good! I was so excited to try out this infinity scarf! I went out and bought 2 yards of four different cotton materials (think Christmas gifts) and got to work right away. I have to say that the tutorial is great and I really didnt have any problems following it. It took less than a half hour start to finish. I do have to admit though that this is a very bulky scarf! I don’t think cotton is the best choice in fabric. Even after I “fluffed it up” like suggested it looked as if I had wrapped a bed sheet around my neck. I would not recommend using cotton-or at least not buying 8 yards of it before sewing one up first! I am now trying to come up with a way to use A LOT of cotton material! Definitely need a scarf-like fabric, like a very lightweight cotton or cotton jersey, silk, silk like rayon or poly. Oh no. I’m sorry you don’t like the way it turned out. Did you wash your fabric before sewing it? The more you wash it and the more you play with the fabric the softer it gets. The fabric in the scarf in the photos that I am wearing and the scarf that my daughter is wearing in the kids tutorial is all cotton, I’m really happy with the way they turned out. You definitely could use another fabric and follow the same tutorial though. It says here that I would need 2 yards to make this scarf. Can I make a kid’s infinity scarf with what’s left? Would it be cut that way where what’s left is still usable for a kid’s scarf? Thanks for the tutorial. Everyone wants these for Christmas. 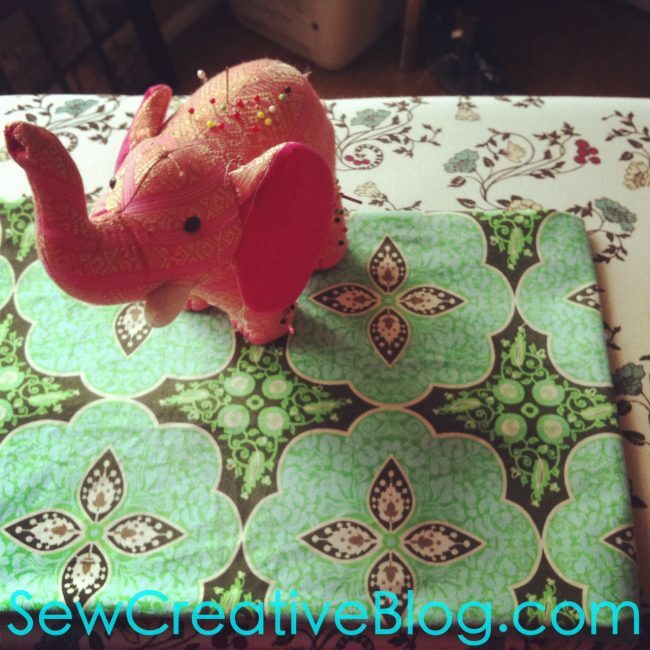 I just want to ask if you have a pattern for your elephant pin cushion…it’s soooo cute!! One thing you have directed in your blog is not really advisable. You always want to cut off the salvages of cotton and woven fabrics. The fabric on the salvage is very different from the rest as it is the part that attaches the waft and loft threads to the loom. It is more tightly woven then the rest and these edges will not shrink or relax in the same fashion as the main part of the fabric. You could end up with some very wonky seams and garments if you don’t remove the salvages before creating them. I used to skip this step on my kiddos dresses, pre-surger days, leaving these “neat edges” for the button edges and never understood why they looked “home made” until a friend, who was a home economics teacher, saw what I was doing and explained it to me. I have had much better results since practicing this advise. Hope this help some beginning sewists. Thank you so much for the information. I had no idea. I really appreciate the tip. I really must invest in a serger one of these days. Finished one today, three more to go for Christmas presents. I love all your close photos. These are better than another tutorial I followed. Scarves get expensive, but if you buy your fabric, OR upcycle a thrifted or owned garment, you save lots of cash. Hi – thanks for the tutorial and nice pics. I have a question on step 2. It says to fold it in half so I have a rectangle of 11″ in length and 2 yards in length….my first question is, did you mean 11″ in width and 2 yards in length? And also, why do we need to make 2 at once? Would I still need 2 yards to make one? Thanks – I may have more questions later…I’m trying this right now! Yes sorry 11″ in width and 2 yards in length. You could just make one scarf. That’s what I usually do, but you would still need 2 yards. You would just have a strip left that is 2 yards long and 22″ wide. Hi there – here’s a variation that seemed to be simpler and make more sense, at least to my feeble brain. At your step 7, turn right side out, but rather than pulling it all the way right side out, she pulled it only halfway, so the tube was inside itself (I think you worded it as “on top of each other”? but I’m not sure if I’m understanding this to be one inside the other, right sides facing, with half the length. Hope it helps your readers. Great tutorial. Your pictures and explanations are so clear that I was able to make this scarf from memory on my first attempt. I have linked to your site with my finished project. Thanks for taking the time to make this tutorial! Oh my goodness! Thank you so much Rosetta! I’m glad that you found the tutorial useful. I am an experienced sewer but still managed to mess up the final seam closure the first time. That is because I thought I could just look at the pictures and completely missed the part where you turned it right side out after pressing the long seam! This is key! Also make sure when lining up your long seam that you don’t have the scarf twisted. That may have been in the instructions but I learned that from lining a jacket. Great easy scarf to make, once you read the directions(LOL), I made 5 Sunday afternoon and I am putting together a couple more this morning. Christmas gifts for my daughters roommate that I am sure they will love. Thanks for the tutorial! Hi, I love this tutorial! I was wondering if I were to put a monogram on this where would I need to put it? A monogram is a very interesting idea. I usually wear the scarf with the seam at the back under my hair so I would suggest putting the monogram perhaps a quarter of the way around the circle from the seam? That way it would sit half way up the scarf on either the left or right side. I’d love to see a picture of your finished scarf! Thanks so much! I’ll give it a try! This is going to be my next project – thanks for the GREAT tutorial! I’m so happy you like the scarf instructions. You can definitely do a twist in the fabric. I actually did my first few scarves this way but I wasn’t as happy with the way they laid when I put them on. You should definitely experiment. I’m so glad that you found my tutorial easy to follow. That makes my day. Thank you so much for trying it out. I’m sure your friends will love their handmade scarves. Great job!!! My daughter just bought some infinity scarves online and they ALL came in FLAT AND very thinly packaged. You are completely right, you must FLUFF! Thanks you so much for visiting! I love this tutorial! I just made one with some cheap knit fabric- worked great, then I monogrammed it using a swirly fancy font. Turned out so cute! I just finished my first scarf using your directions. It turned out great. My fabric was only about 1 1/2 yards but it still works. I probably will just let it loop once. My mom passed away in january and I had some of her last fabric stash. I am going to make a scarf for each of my sisters. Happy Sewing. Thank you so much for trying out my infinity scarf tutorial. I’m very sorry to hear about your mother. My thoughts are with you. What a lovely keepsake for your sisters for you to make them a scarf made with her fabric. So thoughtful of you. Thank you so much for visiting. The salvage is the long edge on both sides of the fabric. One side will usually have the name of the fabric design, the fabric designer and circles with the colors that are in the fabric… look at the photo in step 5 for a picture of the salvage edge. Good luck with your infinity scarf! I made one today! I love it. Thanks for your tutorial. I used 3 second hand t-shirts for the fabric. One has a bright elephant on it. It was about 70″ long and 8″ wide. It was longer but I ended up cutting it and making it shorter. That sounds so cool Jen! I’d love to see a picture if you have one. I’m really glad you enjoyed the tutorial. I am making this out of knit and the last time i tried a similar tutorial, the long seam became kind of shirred when i sewed it. Could i do the lomg seam on my serger? I haven’t tried this with knit fabric and I don’t have a serger, lol… but I think that using a serger could be a good option! If you try it let me know how it goes. I LOVE this tutorial. I bought double sided fabric and was able to make 2 scarves for the price of one, since you cut the fabric down the middle. I finished both scarves within 30 minutes. Thank you so much! Thank you so much Anna! I’m glad you enjoyed the tutorial. I’d love to see photos if you took any. I’m sorry if someone already asked this, but did you prewash your fabric? Thanks for the tutorial! Thumbs up for your tutorial, you shared the basic and easy to follow directions. I’m glad that I find this site, now; I can make my own infinity scarf! Thanks, really appreciated your article! A handmade scarf is the best gift as well – full of love by the giver. I’m so glad that my tutorial matched how you made your infinity scarf! Thank you so much for visiting. I appreciate you bookmarking my site. Thank you for the tutorial. One minor change that I made was to simply line up the seams inside with right sides together. ( and not turn it right side out after sewing the long side seam. ) for the last piece of machine sewing. This made it super easy to sew and turn. I am a beginner sewer and I have a question, and maybe it’s a stupid question I don’t know… It said that this makes two scarves? When in your tutorial did it say to split it into two? Maybe I just missed a step? Thanks! There is no such thing as a stupid question. I’m sorry if it was unclear. The 2 yards in length of fabric that you need for this project could be used to make 2 scarves. In step 1 you cut the fabric in half by length so that it is 22 inches in width by 2 yards in length. You would have 2 pieces of fabric in that size so you could make two scarves with it. Just made a scarf. 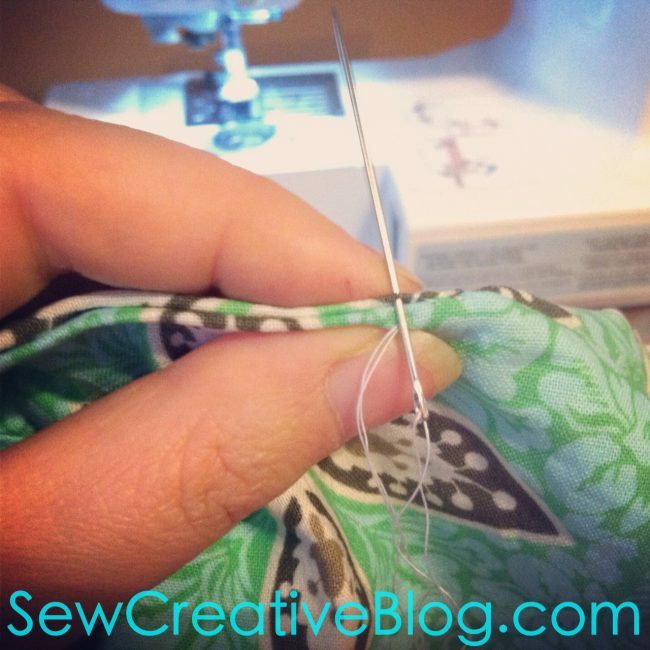 Sew a tube right sides together, leaving a 4″ opening in a long seam. Then reach inside the tube and pull one end to the other, leaving half inside the other half. The ends will be right sides together, just sew the whole tube together. Then turn right side out through the 4″ opening and slip stitch that opening. Tons easier!!! watched it on program Sew it All. Great tip! Thanks for sharing Sandy! You absolutely can shorten it if you would like. The one in the photo is 2 yards, but you could shorten it as well. 60 inches would probably be fine. Thank you so much for visiting and for trying my tutorial! Let me know if you have any other questions. These directions were much easier to follow than another site I found. Thank you for really making it simple! Thank you so much for your comment Marie. You have no idea how much they mean to me. When I created this post I was really going for that. I’m a very visual learner so wanted to make a tutorial that was visually easy to follow. Thank you so much for visiting and for your comment. I teach a group of young girls to sew and this will be a great project. Thanks so much! Great tutorial. I have made lots of these for presents. They are so quick, easy and a fun project. I like the knit fabrics best as they sit better. Another tip is to use 2 different prints in the same scarf! Half and half. Makes for a great effect. Thanks for the tutorial! Although for a beginner, or if you haven’t got your material cut or your machiene ready… I wouldn’t quite call that 30 minutes! Also i was trying for ages how to figure out joining the scarf together, then decided to just figure it out myself, and then managed it. I would suggest doing the same – and maybe doing this video as a tutorial, as to explain that part in words is stuff- would be much better to be seen. Amazing after I totally messed the scarf up, and then sorta figured out how to fix it, I got online and saw this wonderful tutorial. Duh, should have looked first but thought I knew what I was doing!!! This made so much sense. Thank you for the info. This was a great tutorial! So quick! Thanks! I will definitely start making some of those scarfs absolutely amazing. Thanks so much. Just made one for a friend and it is perfect! What a quick and satisfying project!! I have never been a scarf person but would really like to try one of these. I don’t want it too bulky so wondering if I use just one yard instead of two it would be smaller. You can definitely experiment with it. What you want to make sure is that the length of the fabric is enough to wrap around your neck (and get over your head). Infinity scarves usually get looped twice so you want the length to be quite long. I think one yard would be too short, but you could definitely get away with less than two yards. You could also change the width of the scarf for a less bulky scarf. Hello Crystal and all, I’m writing today to supply some information that may help some of you. 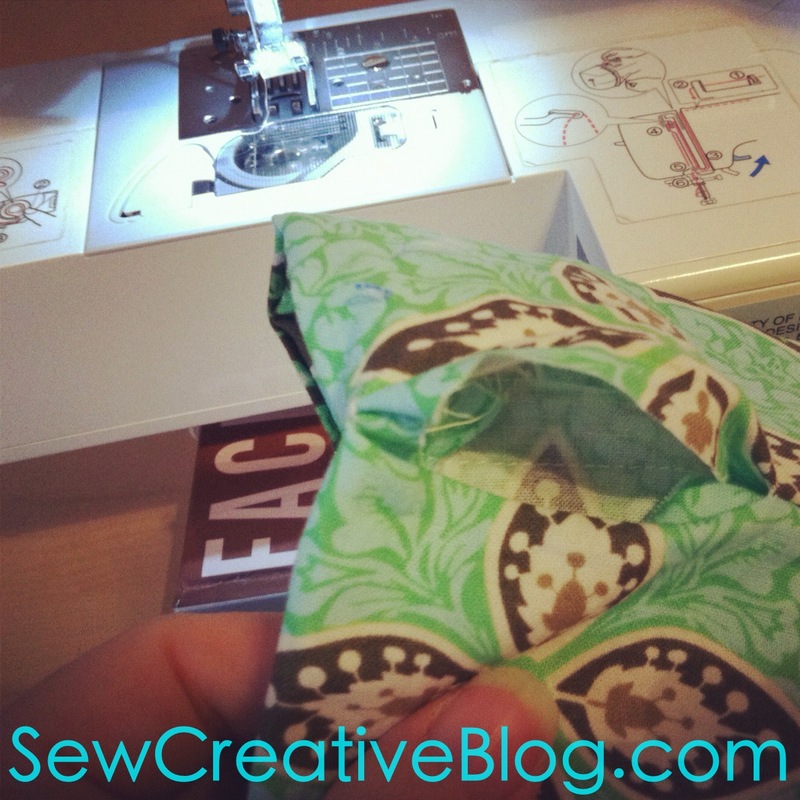 It’s something my mother taught me on the first day she taught me to sew my first project – a handkerchief! The edges of the fabric that are bulkier and more tightly woven are known as the SELVEDGE EDGES of the fabric. Very often, the name of the manufacturer and name of the fabric are printed there, as well as color dots that show what all colors are contained on the fabric. As has been noted, the selvedge edges of the fabric can cause ripples if left on pieces that are cut and sewn. The selvedge edges are parallel to the straight of the grain, which is usually used with long pattern pieces aligned on the straight of the grain, so they hang properly when incorporated into a garment. For instance, a dress, skirt, pants, or long sleeves. The straight of the grain typically has less “give” than the cross-grain, which has more “stretch”. The cross grain is perpendicular to (at 90 degrees to) the straight of the grain. The most give is on the bias, which is situated at 45 degrees, or half way between the straight and cross grain. This is helpful when making bias tape for hems or arm hole trims, as it’s meant to curve easily and well, with no gaping. I really do appreciate you taking the time to share all of your information with us! I also love that your mom passed a love for sewing on to you! 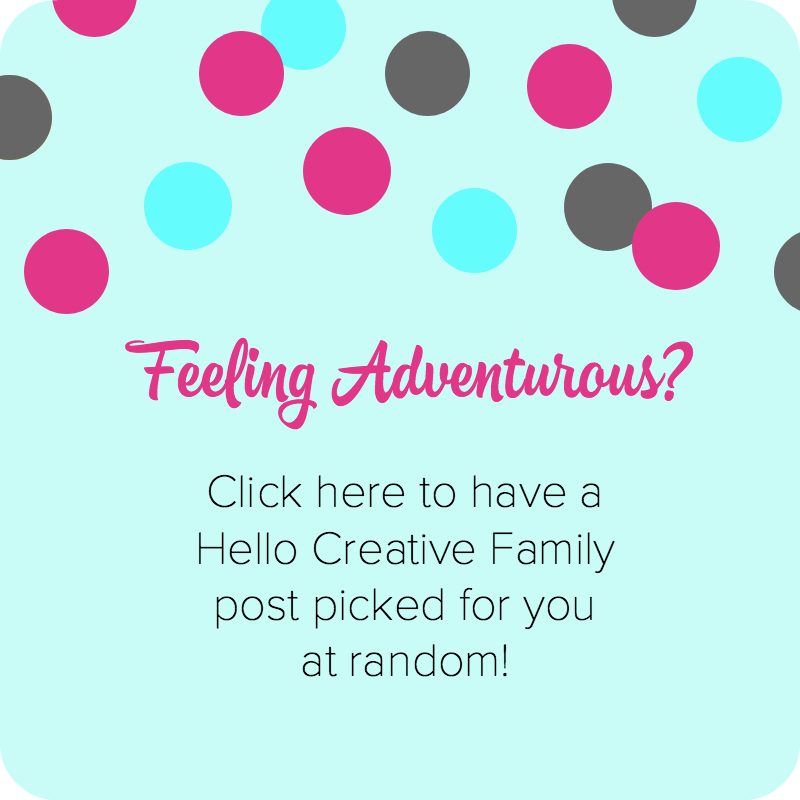 That’s what Hello Creative Family is all about– parents creating a handmade, homemade, heart-made home for their children!